Significance : One of the tallest churches in India. Timings : 5:00 a.m. to 6:30 p.m. 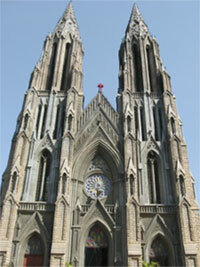 Built in neo-Gothic style, St. Philomena's church is a major tourist attraction and a well known landmark of Mysore. Located about 3 kms from Mysore city on Ashoka road (Mysore-Bangalore Road), it is one of the tallest churches in India. Presently known as St. Joseph's Church, it is dedicated to a 3rd century saint, Philomena from Greece. Initially, it was a small church stood on the grounds given by Maharaja Krishnaraja Wodeyar III in 1840. Actually, he gave the plot to build a church when a need for a Christian church was felt in 1799 when the capital of Mysore state was moved from Srirangapatanam to Mysore city and many British officers and soldiers came and settled here. In 1933, Krishnaraja Wodeyar IV ( the grandson of Maharaja Krishnaraja Wodeyar III) laid the foundation of a new larger church. It was designed by a French architect and was again remodeled and completed under the Mysore Bishop, Rene Feuga's supervision. The present Gothic structure with its high vaulted ceiling is said to resemble St. Patrick's Cathedral in New York and Gothic Church Cologne Cathedral in Germany. Built with light, fawn-coloured stone, the church has two tapering spires with church bells rising to a height of 175 ft. visible from miles around. In front of this beautiful church is a small green patch with a tiny garden. The floor plan of the cathedral is in the shape of a cross. The long part of the cross is the 'nave', which is the tall and spacious prayer hall with a seating capacity of 800 people with wooden benches arranged in queues. The two arms of the cross form the transepts and the fourth part forms the altar. The white walls of the church is endowed with pointed arches and tined windows. The stained glass windows, made in France adds to the artistic grandeur of the church. These beautiful glass-windows depict scenes from the life of Christ -his Birth, the Last Supper, the Crucifixion, the Resurrection and the Ascension. Below the main marble altar, the church has an underground chamber enclosing a statue of St. Philomena from France, in a sleeping posture as well as a relic of the saint obtained from Peter Pisani, Apostolic Delegate of the East Indies in 1926. The relic is preserved at the centre of a beautiful shield. There is also a statue of Christ which lies beyond the altar. The church runs an orphanage in its premises. The Holy Mass is held daily in Kannada, Tamil and English. Special prayers are held on Sundays and during festivals. The annual Feast of the church is held on August 11th. Photography inside the cathedral is strictly prohibited. The church is open everyday from 5am to 6.30pm.